Do you rememberthe first time you abandoned Automatic for Manual or Aperture Priority? That milestone was probably nerve-racking and more than a bit frustrating at first, but you were determined to take your photography to the next level. Initially, you were probably happy just to expose an image that wasn't blurry or blown-out. But, soon you started to master life beyond "Automatic" and really wanted to share your creative successes with others. Your first prints probably came via Costco, but sooner or later your work improved and you purchased your first photo inkjet printer. Here too, you were probably easily pleased at first. At some point, though, as you continued tohone your craft, your standards rose, and you became more critical of your ownwork. What once passed as a great image,now seemed to your refined eye to be obviously flawed. To reach the next level, we all progress to more expensive cameras, computers, software, and printers...and, we expend hours engrossed in study and research to get the most out of those investments. Soon, we become aspiring Photoshop experts, fussing over images and printing to exhibit our work. At about this point, we become aware of and perhaps frustrated with Color Management. You may be struggling with inconsistent results or are just striving for optimal color quality. Again, you are ready “to take it the next level”. Color Management is your next Right of Passage. You most likely are at least a bit familiar with profiles...sRGB in particular. This profile (aka Color Space) is the"Automatic Mode" of profiles--that is, its the garden variety color space that comes default on virtually all digital cameras and computer equipment. What is Color Management's equivalent of shooting Manual or Av? It's getting off the sRGB defaults and using a larger, more vibrant color space like Adobe RGB (1998) or ProPhoto RGB. This is because sRGB only supports about 31% of visible colors vs 51% with Adobe RGB and a whopping 91% with ProPhoto RGB. These wider colorspaces are the path to more vibrant, saturated colors. Learn and use calibration techniques and you'll enjoy these more vibrant colors more accurately and consistently. Unfortunately, there is a mine field of settings to get right to use these concepts successfully. Get those settings wrong, and your colors go horribly wrong. Add to that confusion over printer profiles, calibration, and perhaps white balance...you might be feeling as anxious and frustrated as that first time you turned the dial from Automatic. 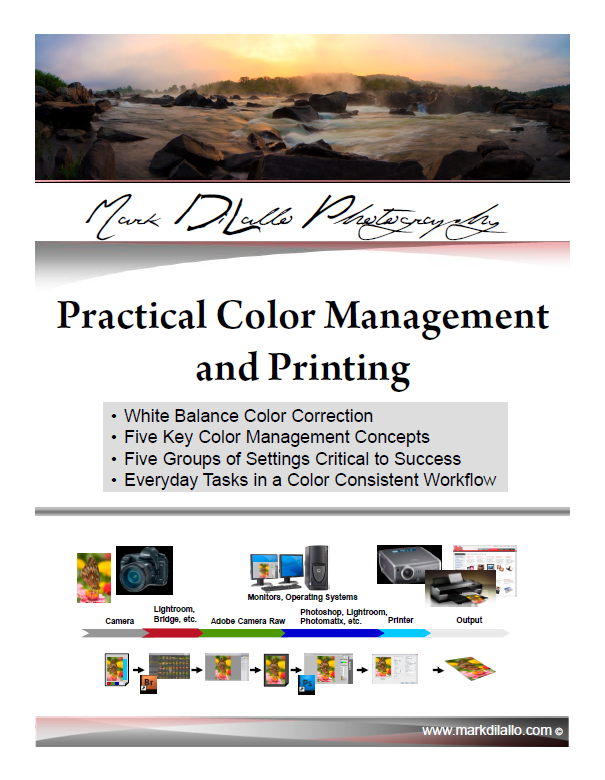 To expedite your Right of Passage and take your results to the next level, I'm happy to announce the release of my latest ebook: Practical Color Management and Printing. Color Management means managing the life of your image files within your workflow to ensure not just quality but compatibility as your file passes from camera to computer, between software applications, and from computer to printer. But it’s more than just about your image file—it’s also about special color files that allow your peripheral devices and computer/software communicate about color. Used correctly, these files ensure your camera, monitor, and printer all communicate properly with your computer and match an international standard for color. So in Color Management, what is the critical element needed throughout the life of your image files? What aligns your devices with a standard? What is the language of color in the digital world? In a word: “Profiles”. They’re everywhere. I can’t make the need for you to understand profiles and practice good color management go away, but I do attempt to be as simple and concise as this subject allows in giving you the knowledge and skills you’ll need to troubleshoot problems and optimize color in your workflow. First, we’ll contrast White Balance & Color Correction vs Color Management. Are you struggling with inaccurate colors somewhere in your workflow? Most of “Color Management” is about calibration and choosing correct profiles and software settings that ensure colors are displayed properly and consistently from device to device. But if you’re original image has an objectionable color cast, all a good Color Management setup will do is preserve that color cast everywhere the image is displayed or printed. So, I begin the book by briefly discussing “White Balance” and “Color Correction” techniques that allow you to adjust the colors of an image. Color Correction, which at a minimum means a good camera White Balance setting, is needed to tame offensive color casts that were present in the scene you photographed (whether you perceived the color cast’s or not). In fact, if you incorrectly set your White Balance, you will introduce a cast where there was none. To evaluate and adjust the colors of an image, you need a good color managed and calibrated setup to trust that the image colors you are seeing on your monitor are accurate, (i.e. to ensure that your monitor is not imposing color casts). Only then can you effectively evaluate white balance and correct colors within an image. Once you get an image’s White Balance “correct”, (aka. to your liking on your monitor), Color Management is again needed to present and preserve colors correctly via every other device and software application throughout your workflow. Having thoroughly explored White Balance and how colors “enter the digital world”, we next discuss what I think are the essential concepts you’ll need in order to practice good color management—just five concepts…not too scary…you can guess the concept of “Profiles” is the big one. We all buy different equipment and software, so there is no one prescriptive list of settings I can give you. You need to know what you are looking at. Next, we’ll explore five groups of color settings and defaults that need to be right. They are hiding in just about every device and bit of software in your workflow. I can’t stress enough how critical these settings are. Gross color errors are almost always due to incorrect settings. The key concepts I stress will help you know where to look, what you are looking at, and will ensure you make good choices. This five-group process helps make it easy to stay organized as you configure for a color workflow that you’ll now know how to design and tailor for your situation. Once all your defaults and settings are right, you’re just about there. However, you will need to know some everyday workflow tasks that involve case-by-case color choices. We’ll cover some invaluable color housekeeping skills to handle about anything you are likely to face. I hope you find this book helpful. Follow this link to download your copy!